As children grow, they are introduced to different toys and several toys have a particular story that is attached to them. From Pinocchio to the Buzz Lightyear, you will find these toys occupying the fantasies of the young and innocent minds of the small children. Although soft toys like teddy bear and pussies are hot favorites with the kids, story toys have also become quite famous among them and you will find at least one toy with every kid with the story associated to it. If you want to develop the habit of coloring and painting in your young child, introduce him to new colors, and develop his artistic side, giving him toy story coloring pages to color is one of the best ways of creating interest. 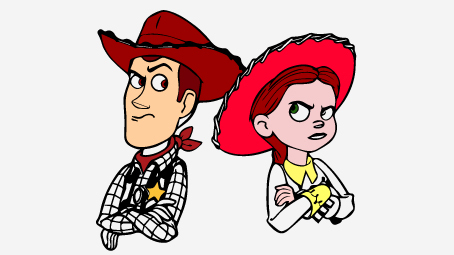 Woody and Jessie are two famous cowboys and their story is almost known to every kindergarten-going child. So, when you give your kid a coloring sheet with the picture of these two cowboys, they will immediately make a connection and show their interest in coloring. Buzz Lightyear is a famous story character and in this picture, he is shown with his equally famous companions, Slinky dog and Rex. Presence of such interesting characters inspires the kids to pick up their crayons and color pencils and start coloring. This is indeed a special picture. Kids love cars, speed and adventure. 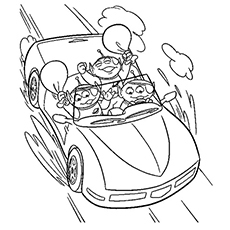 With their famous Toy Aliens, racing and enjoying in the car they will definitely feel inspired to color them and complete it fast. These characters have their own unique features and by coloring them, the children learn to identify the specifics of different characters. 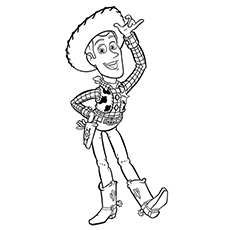 Many kids simply love woody and that is why this toy story coloring sheet is very special for them as it has only the cheerful Woody running alone. The colors of the dresses of these toy characters are already famous, so the children have just to identify different colors and complete the sheet accordingly. Buzz Lightyear the famous toy character who performs all the adventurous activities in the stories is shown taking a leap forward and is in a very happy mood. Buzz has interesting character and small children find coloring him much easier. The two protagonist of the Toy story –Woody and Buzz Lightyear are show together in this picture much to the delight of the young kids. 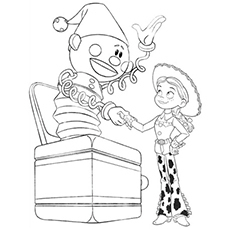 They are sure to have fun in coloring their two favorite Toy story characters in one coloring page. 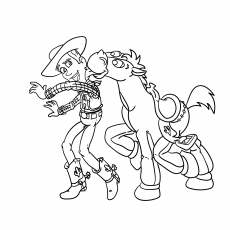 Woody and the horse Bullseye are great friends and the two are shown in a playful mood in this coloring sheet. This coloring page gives the children the opportunity to color an animal as well as a human character. These two are the real human characters in the Toy Story. Here you can see Andy holding the toy Woody while Bonnie is curiously looking from over the back. This coloring page is ideal for kids who are past their kindergarten and now can color according to the mood and expressions of character in the coloring page. 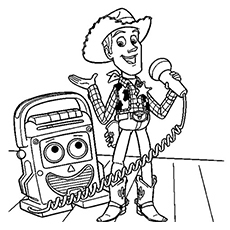 Woody in this picture is talking with all his Toy story-3 friends using a peculiar and expressive microphone. Small children love such expressive toys, characters, and are drawn towards them. By making them color such pages, you can easily introduce them to different ways of using color combinations. Children love pets like dogs and cats. 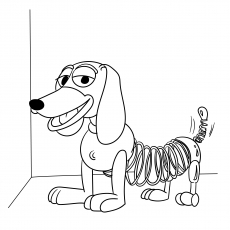 The slinky dog in the Toy story is a Dachshund dog that has its latter half made with spiral coils. It is certainly, an interesting picture for coloring! Rex is believed to represent an excitable large, green, plastic Tyrannosaurus red. Rex suffers from anxiety, an inferiority complex and his main concern is that he is not scary enough. He is among the largest of Andy’s toys, and is often depicted as the heaviest. Although, Rex is a toy dinosaur he dislikes confrontation and is sensitive in nature. If your child has watched the film Jurassic Park already knows that a tyrannosaurus is really dangerous and eats up humans, but this Rex is of much gentle nature. 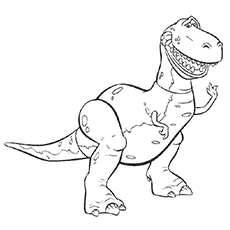 Your child will enjoy coloring this docile and friendly dinosaur toy. It is important to encourage your child to gather information and be aware of his surrounding, just like Hamms. If your child has a toy piggy bank, you can teach him to save money. If you have already started giving him pocket money, teach him to save it in the piggy bank. 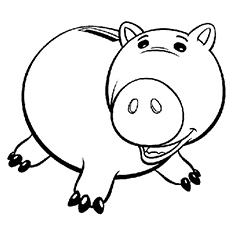 Your child will love coloring this intelligent toy piggy bank and will aspire to be like Hamms. Mr. Potato Head or simply Potato Head is a doll based on the real-life toy by Playskool. 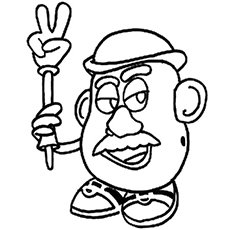 He is an outspoken and sarcastic potato-shaped toy. His can separate his detachable parts from his body by removing them from the holes on his body. He can reach for his detachable body parts even if they are several meters away from his main body. Your child will be amused by the queer shape of this toy. He must have similar detachable toy in his toy basket. He will enjoy coloring potatohead. Emperor Zurg or simply Zurg is the Enemy of the Galactic Alliance and the archenemy of Buzz Lightyear. He is one of the new toys donated to Sunnyside Daycare. He appears in Toy Story 2. He is a villain like the Hugging Bear and looks really sinister. In this picture we are seeing holding a gun and fighting against his arch rival Buzz the Lightyear. Your child who loves adventurous fighting sequences will like coloring this picture. 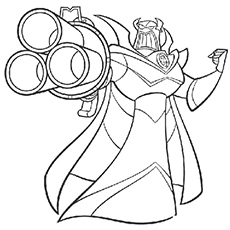 They will enjoy coloring the minute details of Zurg. If your child has watched Western Cowboy films, must be aware how stylish and beautiful cowgirls look! They have a distinct dressing style and daring attitude that make them look smart. 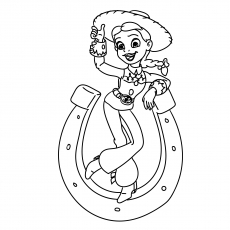 Your little girl will enjoy this pretty looking cowgirl Jessie. She will take special care while coloring the dress and make Jessie look even more cute. You can ask her to use glitter colors to add a magic touch to this picture. You can use this coloring page as a poster for your daughter’s bedroom. She will be happy and proud of her art work. You can ask her to write her name, age and date on the page. When your child grows up you can show her all these coloring pages! Does your little one always hum the nursery rhyme, Mary had a little lamb? If yes, then this coloring is just meant for your kid. 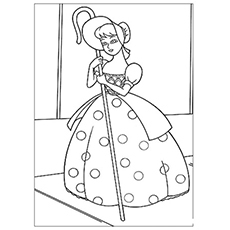 Your child will enjoy coloring this pretty little shepherdess with a staff and a hat. Girls will enjoy coloring this toy’s dress and make her look even more bright and beautiful. This is a perfect greeting card for a friend’s birthday. It is always better to give a homemade card than a commercial card, because a card made by your child will have his own creative touch and will be more appreciated by his friend. 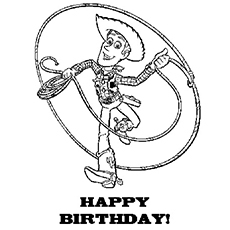 Since, your child loves his friends and will take care to color Woody and make this card even more special for his best friend! Sherriff Woody is the most interesting character of Toy Story and if your child has watched the Toy Story series will love this character because of his sense of witty humor and amiable nature. Children enjoy playing with toy soldiers. They arrange identical looking toy soldiers in a same line and act like a general shouting orders to them. Little children love adventure, thrill, speed and action and so they love playing with toy soldiers. 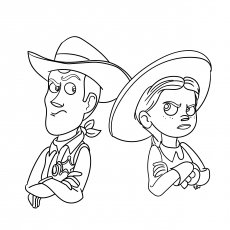 They are like Andy and Bonnie, the human characters of the Toy Story series who loved playing with their talking toys. 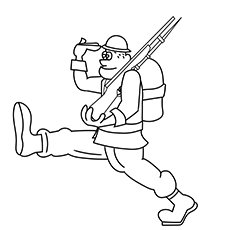 In this picture we see a soldier saluting and have a binocular in his hands to check the presence of foes. A soldier’s life is risky and they fight for their country so the civilians can live in peace. It is a good opportunity to teach your child to respect the soldiers of his country and value their sacrifice. Lotso Hugging Bear was Daisy’s Christmas present. However, Lotso became evil after Daisy denied him of her love and care. Lotso was the antagonist in Toy Story 3 and created mayhem in the Sunnyside Day Care Center for toys. This adorable looking bear was shown as a positive character in the first two series, but turned a villain in Toy Story 3. Your child might be sad with the change, and will take great care in coloring the hugging bear to make him happy and make him good all over again. The cowgirl Jessie received a surprise when this clown jumped from the box and shook Jessie’s hand. See how happy Jessie looks in the picture. You can also surprise your child with a Jack in the Box! You can create a Jack in the box at home; you can take a small toy and stick it in a colorful cardboard box with a spring. Seal the box with a cello tape. Ask your child to open the seal of the box, and watch the amazement on his face! 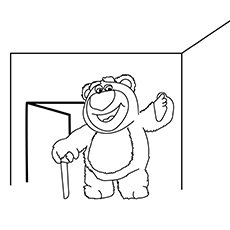 If you already tried the trick with your child, he will remember it while coloring this page. 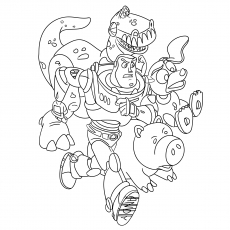 There are umpteen free and printable toy story coloring pages that you can choose from on the internet. Pick pages that have detailing which will allow for your child to put his imagination into play. You cannot just use oil pastels, and wax crayons to color these pages, but also use water colors to paint them in vibrant colors. Your child must be having many dolls too, but they have not seen his dolls walk and talk. Here is an opportunity to show him the Toy Stories series and spark his imagination. Children will love watching Buzz, Woody and Jessie of the Round Up gang and their adventures. Other toys help the trio to achieve success in their missions. The Toy Story also shows the victory of good over evil, and the stories end on a happy note much to the delight of the little children. Since Toy Story films are his favorite, they will also enjoying coloring the pages. Coloring and drawing will not only keep him busy but will also nurture his imagination and make him think creatively. Sit with your child while he is coloring, you will be able to understand how is little mind works and whether his motor abilities have developed to the fullest. So happy coloring! 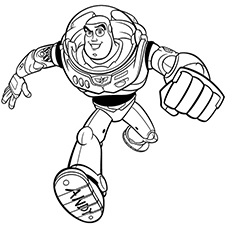 There are umpteen free printable toy story coloring pages online that you can choose from on the internet. Pick pages that has detailing which will allow for your child to put his imagination into play. You cannot just use oil pastels, and wax crayons to color these pages, but also use water colors to paint them in vibrant colors.